A woman charts her wild time-machine journey of DNA genetic testing and, through it all, finds a sense of belonging. One recent Christmas, my parents sent me a small box containing an empty vial. All I had to do, according to a note on the box that read like something from Alice in Wonderland, was spit. So I spat. Then I spat several more times to reach a fill line. And then I sent the sample off to a lab, where technicians extracted epithelial cells from my saliva and extracted DNA from those cells. While well over 99 percent of my DNA is exactly like yours (and about 96 percent the same as a chimp's, by the way), the results I would receive would only involve the few and tiny differences in my strands—the sequences of nucleotides that make me truly me. Just spit, and find out more about where you came from, who you really are and what will happen to you next. It's like your body telling a secret to your mind. It's like tea leaves or palm readings or tarot cards—if any of those things were solidly based in scientific fact. It's like getting a cheat sheet to your life, information that could change how you see and do everything. I had read articles here and there about the genetic-testing company, 23andMe, that analyzed my DNA. There were stories of people finding their long-lost children, but also stories of people finding out their dad wasn't their biological dad. There were stories of people learning amazing facts about their past, but also stories about people discovering secrets better left buried. There were stories about how DNA testing could even save your life, but also stories about genetics companies hoarding medical information. Was I opening a double-stranded can of worms for no reason except curiosity? DNA testing would be like opening a gift (and mine was literally a gift), except the contents could be good or bad or both—and that's the feeling I had when an email informed me several weeks later that my results were ready to view. I am not exactly a stranger to the wonders of DNA. My parents both happen to hold doctorates in medical science and have professional backgrounds that run fairly parallel to the unfolding story of genetic research over the past five decades. I grew up in a home where science ruled. When I asked where babies came from, I got a Darwinian fairytale from my father. When I asked what happens when we die, I got a blunt but loving lesson in decomposition from my mother. Although I was ambivalent about spending hundreds of dollars on genetic testing—current 23andMe kits run $199—my parents seemed much more aware of the benefits and opportunities that could come from the experience. Finally, they told me, with commercial DNA sequencing, we would receive three pieces of information denied all humans who came before us: unimaginable answers about our past (through analyzing our mitochondrial DNA), insights into our present (through analyzing our traits) and hints about our future (through analyzing our known health risks). My mom, who has always loved being on the cutting edge of technology (she boasts having owned one of the first calculators, one of the first VCRs and, more recently, one of the first Apple watches), saw the potential of a revolution in how individuals could care for their own health, from how doctors would decide on cancer treatments to how annual physicals would be conducted. I didn't quite understand the extent of her excitement about DNA home testing until I read her 23andMe profile, which reads simply, "To be able to participate in the dawn of personalized medicine is beyond my wildest dreams." The first half of your DNA results deal with your ancestors: who you are, based on where you came from. 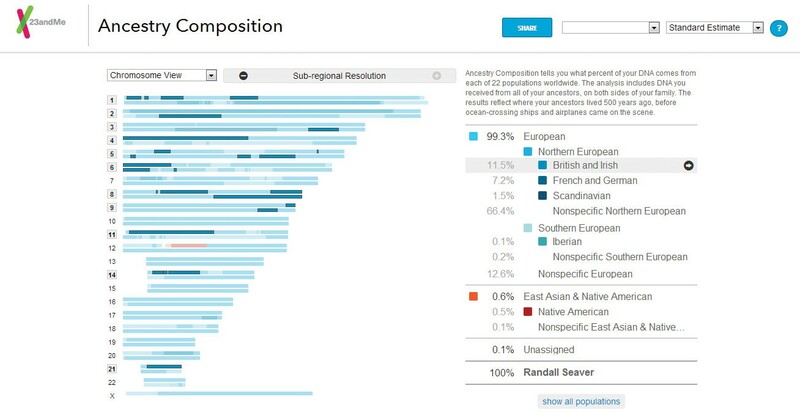 When I first logged onto the 23andMe website, I was welcomed by a visual breakdown of my ancestral composition based on region, a list of my known relatives with 23andMe accounts (based on our common genes) and a rough sketch of a shaggy Neanderthal, who informed me of my exact percentage of Neanderthal ancestry: 2.8 percent. I looked at the Neanderthal, who, like all sketches of Neanderthals, seemed to be looking off to the side, as if focused on evolving off the page. I hoped we did not share the same brow. 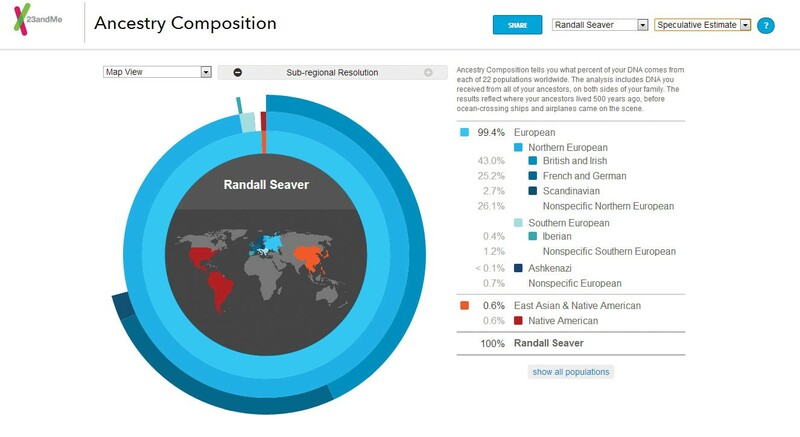 The details of my ancestry results contained one immediate surprise—and one that was echoed in my father's and grandmother's results. Although we had considered it a fact that my "Maw-Maw" was Korean, her genes told a different story. She is actually 25 percent Japanese. Two generations later, I am about 15 percent Korean and 10 percent Japanese, with about 5 percent of random East Asian genes mixed in—math that only works due to chromosomal crossing over. While my immediate family took the news with interest and acceptance—after all, as my dad pointed out, you can literally see Korea from Japan—it was information that wasn't especially welcomed by my older Korean relatives, all of whom harbor understandable animosity toward the Japanese after a long history of conflict between the nations and cultures. We debated telling my 92-year-old grandmother at all, or simply withholding the information. One of my great uncles hasn't spoken to my dad since he mentioned the genetic discovery, highlighting one of the possible hazards of getting your DNA analyzed: finding out that you are literally your own worst enemy. The next ancestry surprise landed in my inbox months later, when a stranger named Derek Dohrman sent me an email simply titled, "Fam?" It was from a computer programmer about my age who shared 1.56 percent of my analyzed segments, making him a probable second or third cousin. I referred him to my mom, who in addition to being a biologist is also a genealogy buff who has traced our family tree back hundreds of years. "David shares a little more than 10 percent of genetic variants with me," my mom explained. "So if you backtrack, his mother would have shared a fourth with me. While we haven't proven anything, it's pretty obvious that Derek's grandmother was my half-sister." It was a piece of information that fit into what we had already pieced together. David's mother, Shirley, who passed away 15 years ago, was adopted and never knew her biological parents. My grandfather lived in Shirley's hometown of Flint, Mich., at the time she was born. My mom suddenly had a half-sister. All of us suddenly had new blood relatives. Finding out I am one-tenth Japanese and that I had an aunt I never knew were certainly interesting facts, as was finding out my mitochondrial DNA traces my heritage back to the ancient Sami reindeer herders 40,000 years ago. But the real treasure is that these discoveries led to conversations with my family members and those conversations led to stories. My dad told me about my great-grandfather who lost everything after the Japanese invaded Korea in 1910. He immigrated to Hawaii after reading an advertisement that said he could get rich there, but then spent the rest of his life working on sugar-cane plantations in poor conditions, exploited for cheap labor. My mom told me about my grandfather's life before he was a Louisiana farmer with eight kids, when he worked in a GM factory in Flint before he was fired for dancing all night and being late for work—not once, but twice. Possibly, we know now, he was dancing with a woman who became pregnant and gave their baby up for adoption. In these cases, the DNA information resulted not in an epiphany, but rather acted as a prompt. It was a gateway into stories I would have otherwise never heard. While a lot of people refer to DNA analysis as a way to find missing puzzle pieces, I found that my DNA results simply encouraged me to appreciate the puzzle. The far more controversial half of DNA testing is the health results. Based on research conducted around the world (including some research involving data from 23andMe participants), the website outlines your health risks, your possible drug interaction, toxicity and response issues and your likely inherited conditions. For example, my biggest health risk is a 20.8 percent chance of being diagnosed with breast cancer during my lifetime, almost twice the risk of the average woman. The U.S. Food & Drug Administration heavily restricted DNA testing health results in 2014 and 2015 but have allowed 23andMe to share modified health results beginning again this year. The reason for the restrictions have been twofold. The FDA required 23andMe to prove its health results were accurate (and accurately portrayed), and they were concerned users of the service did not have enough knowledge or information to understand or process their results. Telling someone they have a genetic marker associated with colitis, for example, is very different than having colitis, developing colitis in the future or passing colitis on to your children. When I asked my mom about what she thought were the biggest drawbacks of getting your DNA tested, she echoed the second concern. "For people who don't have much of a science background, they might jump to conclusions," she said. "They might just assume they're going to get a disease. They might not talk to their doctor about it. They might become depressed about it. Or they might start demanding expensive tests. It is not as simple as it used to be. It's not like Mendelian inheritance with big B's and little B's like you learned in high school. The interactions of genes and proteins can throw everything off. You might have one marker that counteracts another marker. Our DNA is doing a lot more than most people have any idea." The main concern posed by critics of direct-to-consumer genetic testing is that there is no requirement for a doctor to be involved—no one to interpret or explain your results, no one to guide your medical decisions after analyzing your traits and risks, no one to tell you the difference between a diagnosis, a trait or a risk, not even someone to explain the extent of your risk, which can be more difficult to understand than it first appears. 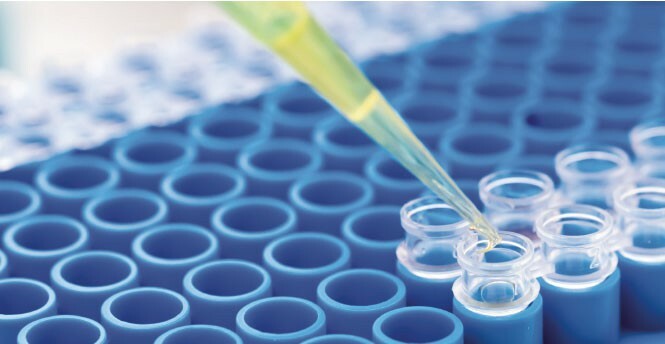 While doctors are now offering DNA analysis and being trained to interpret and use the information, it is not a mandatory component of testing. The 23andMe platform now tries to combat these issues by educating its users, which can be a challenge since what we know about genetics changes literally by the day. When I clicked on my 20.8 percent risk for breast cancer, for example, I was sent to a page with links to support groups, genetic counselors and additional DNA tests specific to breast cancer. I also saw detailed information about my risk—of eight breast cancer markers, I had an increased risk for cancer based on six markers and decreased risk for two. The page also reminded me that getting breast cancer is only an estimated 27-40 percent genetic. Under that reminder is a list of steps I could take to protect myself, from maintaining my weight and limiting alcohol intake to avoiding hormonal birth control. I suddenly felt a huge, new accountability for my health. Now that I knew I was at risk for breast cancer, would I feel guilty every time I gained 5 pounds or ordered a pint of beer? If I do get diagnosed with breast cancer, will I feel that it was 60-73 percent my fault? I also experienced some of the fear that many have raised about personalized medicine: Could this or other genetic information be used against me? I gave 23andMe permission to use my information for research, but how could others use it in the future? Could having breast cancer markers affect the price of my health insurance or my status in society or even my daughters' abilities to find partners or have children? While some of these concerns edge toward conspiracy theory, there are real questions about how raw DNA data will be used 10, 20 or 100 years from now. And yet other people in my family had breakthroughs in their health that permanently changed their lives for the better. My mom discovered her body doesn't metabolize caffeine and other drugs efficiently, which was causing her frightening heart problems. And my brother was able to better understand the autoimmune issues he has been struggling with since he was a kid. They agree the information they discovered was worth the risk of their genetic information now existing in a computer file. Perhaps the oddest part about DNA analysis is that you get a lot of information you already know and a lot of simple statements about who you are, right now. I am a female with straight brown hair and brown eyes. I am lactose intolerant. I tend to have big babies. I like the taste of broccoli. I have wet earwax, whatever that means­. But from there, it gets stranger. As researchers delve deeper into genetic research, they are making connections between genes and traits that are more and more subtle and abstract. Promethease, a computer program that analyzes your raw data DNA file and compares it directly to SNPedia, a public human genetics database, provides anyone who has access to their DNA file with ongoing information about their variants as researchers make progress. For $5, I uploaded my 23andMe data file to have Promethease tell me that I have a higher pain tolerance than the average person, that I likely have slightly better body odor than average and that I probably perform well under pressure. These trait results sounded more like a horoscope than the results of DNA analysis, and in a way, they are, since the science is both complex and far from perfect. For me, being told who I am seemed much more personal than being told where I come from or where I might go. For example, I carry the A1 variant, which everyone agrees is bad. It's associated with not being able to learn from your mistakes, with addiction problems, with the inability to be persistent and with the inability to respond to errors. As I read about this trait, which lives in each and every one of my cells, I wondered how I should process this knowledge about myself. Do I fight against it? Do I accept it? Do I simply try to be more aware of my weaknesses? It's the heart-dropping feeling you get when you walk into the break room and your co-workers are joking about something you do, except you know with certainty what they are saying is true. It's a flaw in who you are, in plain language, laid bare. DNA testing might be able to tell you your cancer risk, but it can't tell you if you'll be hit by a bus tomorrow. It can tell you who your father is, but it can't tell you who you consider your father. It can tell you you have trouble learning from your mistakes, but it can't tell you you'll never learn. As I spoke to my family members about their experiences with DNA testing, patterns and themes began to emerge. Most people said they didn't think about their results very often. Most people said they are glad to know about future health risks. And everyone said they would do it again. But the biggest consensus surprised me. Almost everyone I spoke to said they had initially spit into that little vial to find out how they were different and special, but what they ended up feeling was closer to everyone else—that the 99 percent of our genome trumped that 1 percent. My new-to-me cousin Derek put it best: "It changed how I feel about myself. When you start to trace your DNA back, you see how many people you are related to, all over the world. It's just a big web of people. It opens your mind up. There's no reason to be so clannish or us-versus-them. We're all related. It's arbitrary and temporary to group ourselves or label ourselves. It's made me a little bit more open." How has getting your DNA analyzed changed your everyday life? JA: I had sporadic bouts of atrial fibrillation over 10 years. When I went into the emergency room the first time, they ran all sorts of tests but didn't give me any information about what caused it. When I got my 23andMe results, I found out that I was homozygous for caffeine metabolism; I had a snip at two alleles that both indicated one of my enzymes that helps metabolize different drugs is not induced properly. My gene doesn't respond properly to break it down. What does caffeine intake and caffeine metabolism have to do with atrial fibrillation? JA: An article noted by 23andMe showed that people who drank two to three cups of coffee and had a heart attack, they had this same snip. If you have two of them, you have an even worse time metabolizing drugs. When I found that out, it was an awakening. I realized that if I cut out caffeine completely, I could solve the problem. And the problem is totally gone now? JA: It took about six months, but my heart completely straightened out. Twice after the first six months, I've drank caffeine and an arrhythmia happened within 24 hours. Since then, it's been about five years with no incidents. I am not on any prescription drugs for it, like blood thinners. I've never gone back to the ER. My heart is happy. I can tell. What's the coolest thing you found out from getting your DNA sequenced? DD: That I'm basically immune to HIV. In my DNA, there is a part of a gene called CCR5 that I'm missing. Both my parents have a deleted mutation on the gene, and I inherited two. I have done a lot of reading on it and it makes me virtually immune to HIV. It codes for certain receptors on blood cells and since I can't make those receptors, the virus can't attach to my cells. That is really cool. Are scientists researching how this knowledge could help cure HIV/AIDS? DD: Yes, they've actually helped someone by giving him stem cells from a donor with the CCR5 mutation, though I am not up-to-date about the most current research. Wow. It's strange because that seems to be a significant thing to learn about yourself, and yet it probably doesn't affect your everyday life. It's probably not something that you think about regularly. But you are still glad you know? DD: You know, after I found out about it, I learned a lot and read a lot about it. That's what I like getting out of it. My initial reason for getting my DNA sequenced was contributing to the growing science of it all, and to learn along the way. And I've learned so much along the way. What's the most interesting aspect of DNA testing to you? MA: I enjoy connecting with the people who reach out to you because you are related. The community that it builds is really cool. I've had several people contact me who want to learn about my family and share information about their family. And each person has their own story. I had one person who wrote to me saying, "I want to find my parents before I die," and that was powerful to me. Do you feel more connected to them just because you have a higher percentage of matching DNA? MA: Yes, I feel more connected because I know we share family somehow. But when you think about history, the further back you go, the more everyone is related. So that's not the primary thing I think about. I think about the person's story. We relate to each other through stories. It's like when you meet someone who went to the same school as you did. You talk about such-and-such a building or about people you might have both known. You say, I grew up in Louisiana, and she says, my dad's from there. It's about making connections. Are we all just looking for a way to relate to each other? MA: I think that it's easy to find other ways to relate to each other, especially with today's technology. You can go to a forum with people who share the same taste in music or movies. You can relate to people in so many ways because you can easily find so many people who like what you like. What makes people who are connected genetically different is the sense of belonging. It allows people to say, hey, we share something more innate. That's the differentiator. You've always hated the taste of cilantro. How does it taste to you? BF: It tastes bad. Honestly, I never would have been able to put my finger on what that bad taste was until I read the report that came with my DNA test, which said I have the gene that makes cilantro taste like soap. That's not a perfect description. It doesn't taste exactly like soap to me, but it does taste bad in the same this-is-not-food sense. But you absolutely already knew that you didn't like cilantro. Why would you need a $200 DNA test to tell you that information about yourself? BF: In a way, the cilantro gene thing was a welcome surprise. I've been accused, not inaccurately, of being an unadventurous eater in the past. So when I asked for the cilantro-free version of things, a part of me felt like that was me being too picky or boring. Learning that there's actually a genetic reason for it, it's some very, very minor form of validation—like walking around with a doctor's note that justifies your tastes. I think that's true of a lot of the DNA results—it's like a fortune-teller warming up by telling you things that have happened in your past. Are there downsides to having your DNA analysis confirm things you already believe about yourself? BF: Going over the report, I noticed that I glossed over things that didn't seem accurate or that didn't fit with how I view myself and latched onto ones that confirmed my beliefs. It's like a horoscope. Except it's a horoscope that tells you if you're likely to develop Alzheimer's, which, frankly, I'd like to know about. Right—a weird kind of confirmation bias. My DNA told me I was a "likely sprinter." And I was like ... oh, well, that was probably some sort of mistake. How do you feel about getting your analysis done, cilantro and all? BF: I can't say that I think about it often. Maybe it's because the report deals largely in terms like "likely" or "slightly less likely," but very little about the genetic traits—which seems definite enough to be more than a curiosity. The thing I think about is the way it grounds you in the vastness of human history. I learned that my genetic haplogroup comes from people who once lived in an area ("Doggerland") that is now the North Sea, but melting glaciers and rising seas eventually forced them out. It's fascinating to think about my ancient ancestors standing around and looking at the trickling stream running through their home wondering if it's their imaginations or if it's actually getting bigger. That gives my day-to-day concerns and my sense of my place in human history some helpful context. Sarah Aswell is a freelance writer for the Missoula Independent, where this article first appeared.